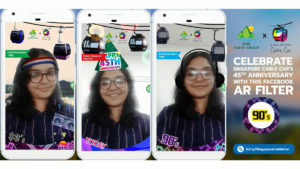 To celebrate the 45th Anniversary of Singapore Cable Car – the most breathtaking way to get into and around Sentosa – One Faber Group has partnered Carbon Interactive and creative technology company AliveNow to create a fun and interactive Facebook AR Camera Filter that takes a user down memory lane. On a visit to Singapore, there are many must-see attractions that tourists have on their itinerary, and top among them is a visit to Faber Peak and riding the Singapore Cable Car. As the years have gone by, the views from the cable car have also changed over time and through this Facebook AR Filter experience, One Faber Group rekindles our desire to hop on a Singapore Cable Car. Users are transported back in time through AR, letting them hang out with their friends, take pictures and record videos, all while wearing fun accessories from the last 4 decades starting from the 1970s up to the present day.